Andrea Marchiol studied Organ at the „Conservatory of Music“ in Udine. Given his particular interest in chamber music he then continued his studies at the „Schola Cantorum Basiliens“. There he worked with Jesper Christensen in harpsichord playing and basso continuo. He has performed as a soloist and chamber musician throughout Europe, Argentina, Australia, and Asia. As an assistant he collaborated with music directors including René Jacobs, Attilio Cremonesi, Alessandro de Marchi und Thomas Hengelbrock, Giuseppe Sinopoli, Sir Colin Davis and Diego Fasolis. As harpsicord-player he performed in various productions at the „Staatsoper Berlin“, „La Monnaie“ in Brüssel, „Théâtre des Champs Elysées“ and the „Théâtre du Châtelet“ in Paris, the „Tiroler Landestheater“ in Innsbruck, „Semperoper Dresden“, „Aalto-Theater Essen“, „Suntory Hall Tokyo“, „Congrss Hall Adelaide“, as well as at the „Theater an der Wien“, and the „Barbican Center in London“. 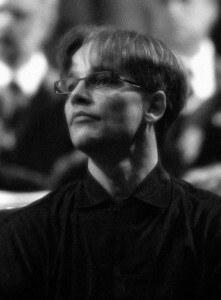 He also collaborated with „Concerto Vocale“, „Ensemble 415“, „Akademie für Alte Musik“, „Freiburger Barockorchester“, „Deutsche Kammerphilharmonie Bremen“, „Staatskapelle Dresden“ and the „London Symphony Orchestra“. In 2006 he debuted as a conductor in Monteverdi’s „Il Ritorno d’Ulisse“ at the „Grand Théâtre“ in Geneva. Since then he has led Handel’s „Ezio“ at „Theater Bonn“, „La Calisto“ at the „Musik Festwochen Innsbruck“, Hasse’s „Piramo e Tisbe“ at the „Potsdam Musikfestspiele“, a concert version of Vivaldi’s „Farnace“ at „Théâtre des Champs-Élysées“, Haendel’s „Rinaldo“ at „Prince Music Theatre Philadelphia“ (USA). Another special highlight during his carreer took place in june 2013 where he conducted Cecilia Bartoli and the baroque music specialists „I Barocchisti“ during their tour „Mission“. He has led seminars on chamber music, harpsichord, and vocal music at the Festival d’arts Lyriques of Aix-en-Provence the University of Tokyo, the University of Mendoza, among other venues. Since 1997 he has been titular organist at the cathedral in Venzone, Italy.